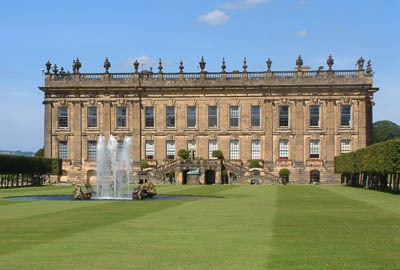 William Cavendish, 2nd Duke of Devonshire and William Cavendish, 3rd Duke of Devonshire made no changes to the house and gardens, but they did contribute greatly to the collection found at Chatsworth to this date. Connoisseur of the arts the collection include paintings, Old Master drawings and prints, ancient coins and carved Greek and Roman sculptures. Palladian furniture designed by William Kent was commissioned by the 3rd Duke when he had Devonshire House in London rebuilt following a fire in 1733. Upon the sale and demolition of Devonshire House in 1924 the furniture was transferred to Chatsworth. The 4th Duke made great changes to the house and gardens. He decided the approach to the house should be from the west and had the old stables and offices as well as parts of Edensor village pulled down so they were not visible from the house. He also replaced the 1st Duke’s formal gardens with a more natural look, designed by Lancelot “Capability” Brown, which he helped bring into fashion. In 1748, the 4th Duke married Lady Charlotte Boyle the sole surviving heiress of Richard Boyle, 3rd Earl of Burlington. Lord Burlington was an accomplished architect in his own right with many works to his name including Chiswick House. With his death, his important collection of architectural drawings and Inigo Jones masque designs, Old Master paintings and William Kent designed furniture were transferred to the Dukes of Devonshire. This inheritance also brought many estates to the family. Floral carpet on a brown ground. The brown of the central floral ‘medallion’ and the border is darker than that of the main field. Although difficult to see now, the contrast originally must have been striking and must have made the central panel stand out markedly. Main field mostly rose and blue convolulus. Central roundel ribbon tied buch of striped tulips, anemones and roses enclosed in a band of overlapping serrated leaves. Very similar to the Axminster carpet now in the Williamsburg Museum USA. The low knot count and main border and guards are the same as the carpet in the Chinese Bedroom at Blickling dated 1765-70. Small, almost square carpet, Turkish large palmette and leaf pattern in deep green and blue. The central leaf design in lighter green and brighter blue. Main border stylised hyacinth and carnation. Five different colourings of the large carnation. Two of the hyacinth stems and smaller carnations. Indo-Persian open flowing design of large and small palmettes on a stem (tree of life) framework, with main field and main border on contrasting ground colours. Two large ‘flaming halo’ palmettes and a smaller greyish-shade palmette, paired up ‘tree of life’ stems. At least fourteen different motifs of stylised flowers, leaves, racemes and other small palmettes fill the spaces. Main border on mid-rose, alternating hexagonal palmettes and large rosettes, linked by flowing cloud bands and leaf stems, mostly outlined in dark brown. Stourhead Saloon and Longleat’s Minstrels gallery have identical main-field design. No illustration so far does full justice to this carpet. This is because colour fading over the years has made many of the intricacies of the design disappear into insignificance. The design is sophisticated and complex. A central patera with ‘sun rays’ emanating from it, broken up with very small, pink paterae, is enclosed in a scalloped, elongated diamond shaped panel, which has a wide border filled with small, pink roses inside two plain scalloped bands. The rest of the main field has a trellis design of squares in yellow greens, buffs and tan lines with an almost indecipherable design inside them. Gigantic flowers on a green-grey main field surrounds a central patera of acanthus and shell shapes with radiating ‘peacock’s tails’ in olives outlined in brown. eight huge acanthus leaf sprays in three different designs fill the corners, centre sides and ends. There is no major border. A fringe of olive acanthus leaves surrounds the entire main field, and the carpet is then edged with two plain bands, the wider outer band in green, and the narrower inner one in buff, with single brown guards separating the bands. One of two carpets with very similar features, presumably made for the Drawing Rooms at Devonshire House.